Recently, Phillips & Associates' managing partner, William K. Phillips, spoke to Downtown Magazine about on-the-job harassment in New York City. 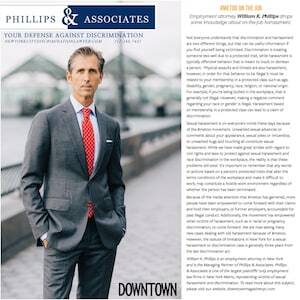 Phillips & Associates is one of the largest plaintiffs' side employment law firms in the New York metro area. Our New York City employment lawyers have substantial experience representing victims of sexual harassment and discrimination. Mr. Phillips explained that discrimination and harassment are two different things. Discrimination occurs when somebody is treated adversely because of a protected characteristic. Meanwhile, harassment is usually offensive conduct that insults or degrades somebody else. It can include physical threats and assaults. Mr. Phillips further explained that workplace harassment is illegal when it is related to one's membership in a protected class, such as religion, race, pregnancy, gender, disability, or age. Generally, workplace bullying is not discriminatory. However, if the bullying involves negative remarks or actions associated with a protected characteristic, such as race or gender, it is. Harassment that is based on membership in a protected class can result in a discrimination claim. Mr. Phillips noted that sexual harassment in particular has been on everyone's minds due to the #MeToo movement. Sexual harassment can include unwelcome sexual comments, sexual advances, jokes, innuendos, and undesirable touching or hugs. There have been huge strides in civil rights jurisprudence and law to guard against sexual harassment and racial discrimination, but in spite of those strides, these problems continue to persist. It is critical to understand that words and actions that are based on protected characteristics that change the terms and conditions of your job and make it hard for you to work can create a hostile work environment. You do not need to receive a termination [link to wrongful termination page] for a hostile work environment to exist. Due to #MeToo and the media attention surrounding it, many people feel empowered to come forward with sexual harassment claims against employers or former employers. The #MeToo movement has also helped victims of other types of harassment, such as racial harassment, come forward. You should be aware that the statute of limitations in New York for sexual harassment or discrimination is usually three years from the last act of discrimination. However, there are some time limits that vary under federal, state, and local laws, so it is wise to consult an experienced employment attorney right away. Should I Bring my Claims Under Federal, State, or Local Law? Federal, state, and local laws have some important differences in terms of the elements of the claim, procedures, and damages. For example, to bring a claim under Title VII of the Civil Rights Act, you will need to first file a charge with the Equal Employment Opportunity Commission (EEOC). Your compensatory and punitive damages if you establish liability will be capped based on the size of the employer. The New York State Human Rights Law, on the other hand, applies to employers of every size when it comes to sexual harassment. You cannot recover punitive damages under the state law. The New York City Human Rights Law applies to smaller employers than does the federal law, and it also allows you to recover damages without a cap. It is widely considered to be one of the strongest anti-discrimination laws in the country. The remedies that you will be able to recover will depend on the circumstances and the law under which you prove your claim. Often, however, they will include back pay and out-of-pocket costs. Sometimes they can include front pay or reinstatement. Mr. Phillips and the other attorneys at Phillips & Associates are dedicated to protecting workers' rights, particularly in the areas of harassment and discrimination. If you are concerned about harassment or discrimination at your job, you should consult our firm. Contact Phillips & Associates at (212) 248-7431 or through our online form for a free consultation. We assist employees in New York City, as well as Westchester, Nassau, and Suffolk Counties, New Jersey, and Pennsylvania.